Role and Attribute level access – ie. a radiologist may have a certain level of access, but a nurse may have a different level of access. 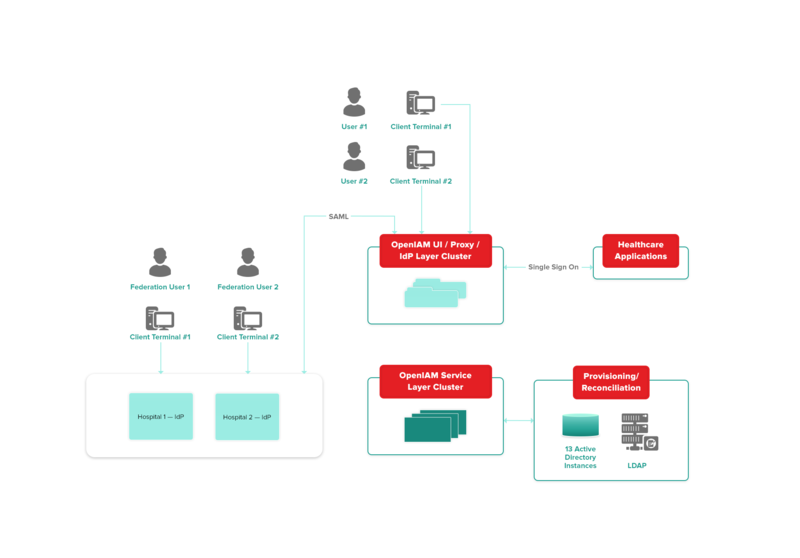 Multi-tenancy – when supporting multiple organizations it’s critical that users in one institution cannot see data belonging to another institution. Multi-tenancy to allow a single deployment to support many institutions and maintain a segregation of data between institutions. Advanced authentication options such as embedded OTP. Rich self-service interface to minimize help desk calls. Health care costs in the US and Canada continue to rise. A shared Diagnostic Imaging Repository (DI-r) provides a way to reduce the costs resulting from physicians ordering duplicate tests. A shared regional DI-r provides clinicians with access to patients’ diagnostic imaging results, including CT scans, ultrasounds, MRIs and x-rays acquired at partner healthcare facilities. OpenIAM was selected to provide Identity and Access Management for this solution. Source data for this solution comes from a number of different sources. These include data in Active Directories or CSV files provided by each institution. The Identity Manager’s synchronization engine was configured to support multi-source systems and business rules were defined to process the source data and associate the users the appropriate business roles, which were then used to drive provisioning into various systems. The solution was configured in a multi-tenant mode where access for hospital staff was limited to their institution, but access for the System Admin at the service provider would span across institutions. The overall solution consisted of a number of applications that did not support federations standards. These applications were protected by the OpenIAM Reverse Proxy and users could SSO into them. Hospitals also wanted their users to be able to SSO into this solution from their own internal portal. To support this model, OpenIAM was configured as a Service Provider (SP) allowing users to access the DI-r without further authentication. Given the strict compliance requirements in Healthcare, the solution architecture created by the systems integrated required that select audit events would be published into the ATNA audit repository. To achieve this, the OpenIAM audit service was extended to publish the selected events. The solution was resilient in its ability to detect if the ATNA repository was down and queue messages till the connection was restored. The OpenIAM solution has been running in production for over three years and has met both its business objectives and high SLAs that OpenIAM must adhere to. The solution allows over 10,000 users to securely access the DI-r solution. During this time, business requirements have continued to change and OpenIAM has been evolving at a rapid rate to allow the service provider to deliver new services in a timely manner.